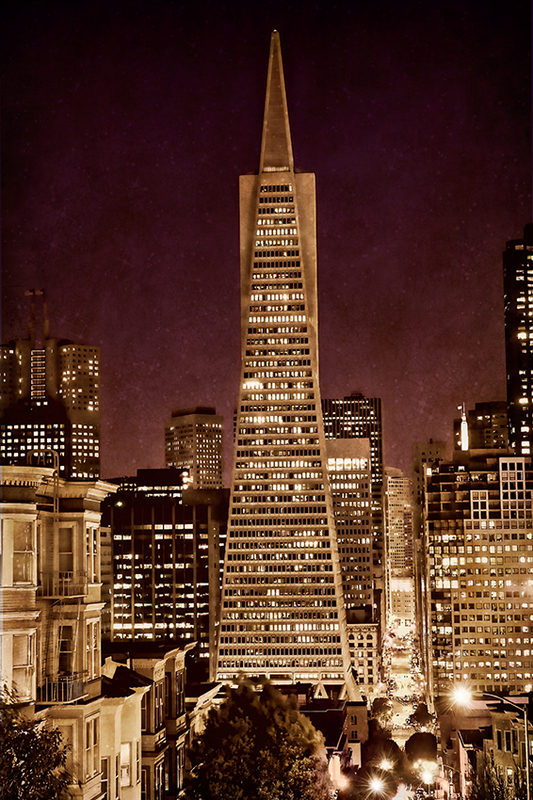 The iconic Transamerica Pyramid building is the tallest skyscraper in San Francisco, a beautiful sight at night. Absolutely one of my favorite places to photograph, I love everything about San Francisco, a very photogenic city! For night shooting, I use a Feisol 3442 tripod, which is lightweight carbon fiber, sturdy and folds down to 19", my favorite tripod for everyday and travel. I use a cable release so that no vibration is transferred to the camera by depressing the shutter (you could also use the self timer feature). Set the white balance for the light conditions you are shooting in, experiment, tweak, and see what happens! This image has a little Topaz Labs magic which makes everything sparkle, including Detail, and Clean, and a layer of texture too. You can use code deborahsandidge for anything Topaz Labs.